Pure water has the highest evaporation speed under boiling conditions. At normal pressure, pure water starts to boil at 100℃. In a vacuum, this boiling point can be reduced greatly, and the higher of vacuum pressure, the lower of boiling point. 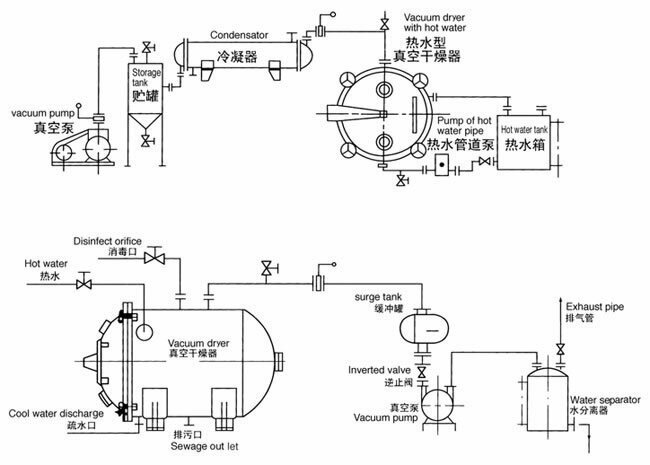 In the vacuum drying machine, evaporated water can be removed quickly by the vacuum system. Therefore, this dryer has larger drying capability although it operates at a lower temperature. The raw material is under static conditions during operation of the equipment, which is a benefit for maintaining the initial status of material. Intermittent operation can adjust process conditions at any time. The FZG vacuum drying machine heating system is designed to tackle the problem of the return of condensed water. In addition, air suction is applied at the side to improve drying efficiency. 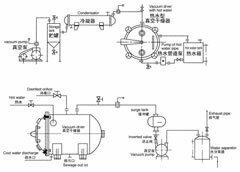 This equipment can be used for low temperature drying and solvent recovery, and the heat source used can be steam, hot water, or heat conducting oil. 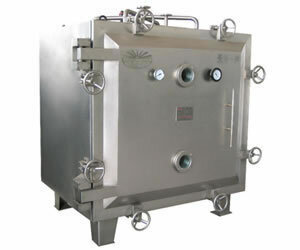 The vacuum drying machine is especially suited for materials that are easily oxidized during drying. When placing your order, please choose the vacuum drying machine suited to the raw materials to be dried, such as, physical properties, beginning moisture, temperature, vacuum degree, amount to be dried, drying time, etc. 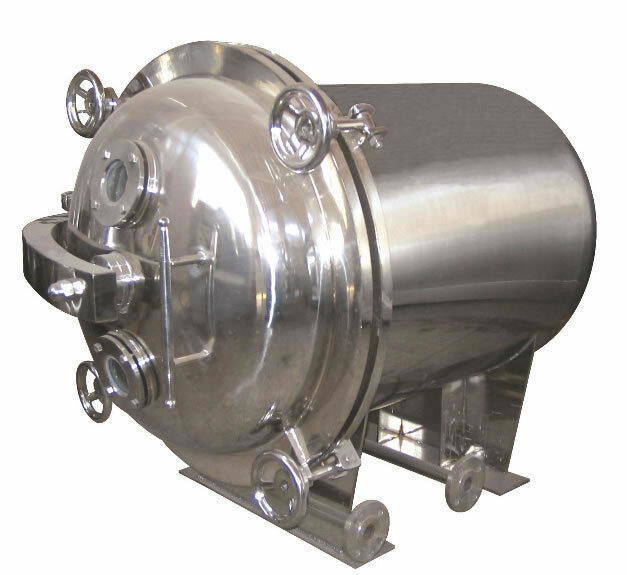 The vacuum dryer is available in models for any of three heat source uses: steam type, hot water type, heat conduction oil. 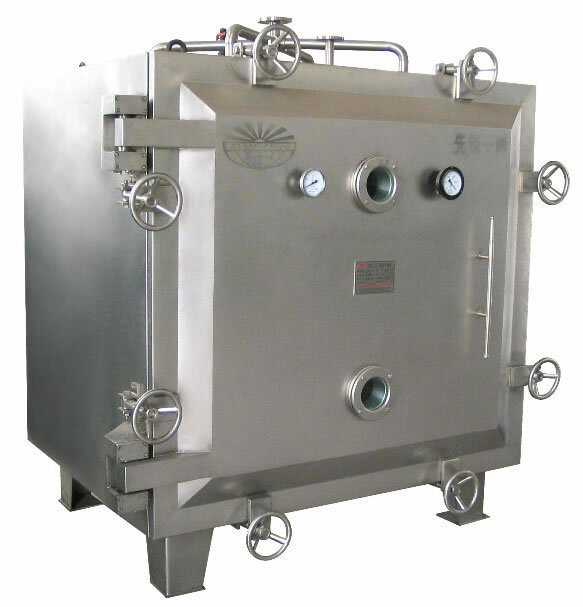 The accessories used for vacuum drying system mentioned in Operation Instruments can be provided and installed by our factory. Please mention when ordering. We can also provide specialized design, manufacture, and installation vacuum drying machines services for the particular requirements of customers. It can achieve a faster drying speed at a lower temperature, making it more energy efficient. It can dry at a low temperature, and so can be used to dry heat-sensitive raw materials. It can dry raw materials that contain solvents which need to be recovered. Before drying, the vacuum drying machine can effect a disinfectant treatment, and during drying, no impurities can enter. Our equipment comes with a guarantee of repair, replacement or refund for substandard products, and we also supply spare parts, so you can feel secure in our service.